Pyropolis....Started with Burning Man, taken over by Texans and invaded by fuckos. 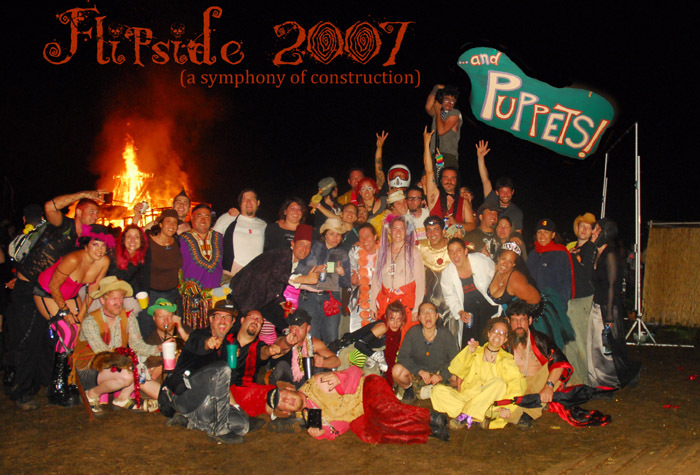 It was the 2nd year at the new camp ground (since we outgrew the old one) and 8th year for Gigsville (my personal 7th) Our theme this year was simple, cheap and stupid - "...and PUPPETS!" WTF you ask? It all began with the now infamous Puppet Karaoke bar in 2003. Since that time we have decided that everything goes better with Puppets. We just made it official. Puppets must happen. This year also included XT and Sylkia's wedding, fish, babies, a Sisyphusian stick and the world's first Puppet Karaoke opera MOULIN TRADGE! This may have been our weirdest year ever.